Nevertheless, here comes a glossy 93-minute photo album of the Bridge Theatre Project’s globetrotting 2011-12 tour of Richard III, Shakespeare’s hit piece about the “deformed, unfinished” last of the Plantagenet kings. The production, which originated at the Old Vic in London and concluded, 198 performances later, at the Brooklyn Academy of Music, was directed by Sam Mendes, now the unlikely keeper of James Bond’s coat of arms, and starred the Old Vic’s artistic director, one Kevin Spacey. (Their first collaboration, the 1999 film American Beauty, brought them both Oscars.) 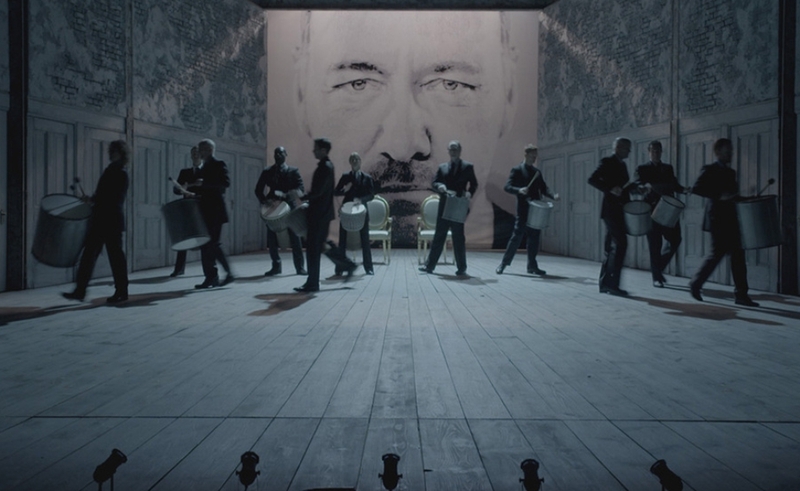 In House Of Cards, the Netflix series where Spacey plays a ruthless, power-hungry U.S. Representative, he addresses his nefarious designs to the camera in prose instead of verse; otherwise, King Richard is essentially the same role. The other 18 members of the company were a mix of primarily British and American actors, whose Shakespearean pedigrees varied substantially. Spacey cops early in the film to having done less Shakespeare than many of his castmates. Unlike Al Pacino’s fine 1996 documentary Looking For Richard (featuring Spacey as the Duke Of Buckingham), this isn’t a deep dive into the plot, character, themes, and context of Richard III. It’s more like an unusually lavish DVD extra that might accompany a film of one of the stage performances. Sure enough, it’s “rudely stamp’d” by the pervasive press-kit puffery to which DVD extras are prone: Everyone felt lucky to be there, the company felt like a family, everyone was honored to work with Mendes and Spacey, blah blah blah. Mendes says he hews to Mike Nichols’ casting philosophy: “Don’t hire any assholes.” His eyes smile when he remarks that Spacey was the only exception he made. Who else would dare such a joke? The film improves once it tucks into text with a dissection of the famous second scene, wherein Lady Anne must go from loathing Richard for slaying her husband and father-in-law to being willing to marry him. Annabel Scholey, who plays Lady Anne, is more enthusiastic than insightful in her interview clips, but she blazes in the excerpts from her performance. The film offers tantalizing glimpses of backstage culture. Spacey explains about “angel cards,” an Old Vic tradition where actors draw from a deck in the dressing room and are to infuse their performance that night with whatever word is printed on the card. (It sounds similar to Brian Eno and Peter Schmidt’s “Oblique Strategies” cards.) The practice where actors try to make each other break composure and laugh onstage, or “corpse,” gets some welcome play. While Jeremy Whelehan’s film rarely digs deeper than is necessary to unearth fun little anecdotes like these, it becomes more seductively watchable as it turns into a sort of luxury travelogue. The troupe brought their modern-dress Richard III to Naples. They brought it to Epidaurus, Greece, where they played at the same 14,000-seat amphitheater where Julius Caesar attended plays 2,100 years ago. They brought it to Sydney and Istanbul and Beijing. They brought it to Doha, Qatar. It would be fascinating to hear how audience response differed in parts of the world where Shakespeare, presumably, isn’t as widely taught or performed as it is in London and New York. But the film barely attempts to engage this question, which is a flaw as glaring as the hump in Richard’s back. Cinematographer Aadel Nodeh-Farahani does a marvelous job of making every one of Richard III’s ports of call look like a fabulously glamorous place to visit, though, especially with a traveling circus of fun-loving drama geeks, and especially especially when traveling first class. “You know, you’re on this yacht going up the Malfi coast to Capri, where these loaded Italians will feed you the best everything you’ve ever had,” says Bobb, who played both Catesby and the Second Murderer, and who has subsequently appeared with Spacey on House Of Cards. Prior to being cast in in Richard III, Bobb had never been outside the United States. With his down-to-Earth presence and his merciful abstinence from New Age-y actorisms, Bobb eclipses even Spacey as the documentary’s star. His candor fails only in a scene that finds the two actors cruising around San Francisco in a gorgeous electric-blue Mustang convertible, with Bobb praising the artistic integrity Spacey demonstrated by walking away from Hollywood for 10 years to work at the Old Vic. True enough, but he still came back for the $200 million Superman Returns. Not long after that, NOW joins the troupe on a joyride through the desert in a caravan of luxury SUVs; they howl with glee as their vehicles careen down steep dunes. It looks like an amazing time. Perhaps a more rigorous, less alluring film rests in pieces on Whelehan’s cutting-room floor. The one he made focuses inordinately on the troupe’s day-off-in-paradise escapades. It’s fitting that the emotion his Richard III doc conjures most powerfully is the one Richard, the Duke of Gloucester, understood best: consuming envy.